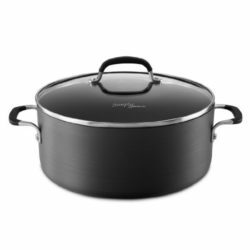 Black Dutch Oven Now Silver This Dutch Oven performs quite well, but, when I order a product in a particular color, I expect it to REMAIN that color. Especially a Calphalon. Yet, about a month ago, as I was HAND washing this pan, all the black just wiped off. It’s now silver. I’ve had it less than a year, and have used it fewer than a dozen times.